Achieve radiant skin on the go with the GLOV Travel Set for Oily Skin. Containing a cleansing mitt, a quick-fix cleanser and a washing tool to keep your kit clean, the set effortlessly sweeps away sebum and rebalances the skin for a refreshed, mattified and glowing complexion. An effortless, efficient and simple way to cleanse skin. 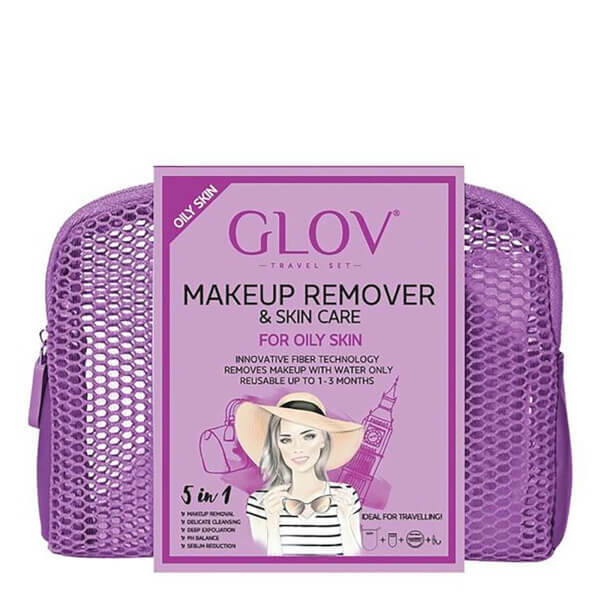 The make-up removing glove utilises advanced micro-fibre technology that is up to 30 times thinner than a cotton pad, with superior electrostatic properties to absorb makeup, dirt and excess oil like a magnet, deeply cleaning clogged pores with a gentle exfoliation process. Perfect for quick cleansing and fixes, the Quick Treat Cleanser is a compact version that fits in your purse for any-time any-place cleansing. The micro fibre tool effortlessly sweeps away mascara smudges or lipstick marks for clean and flawless results. 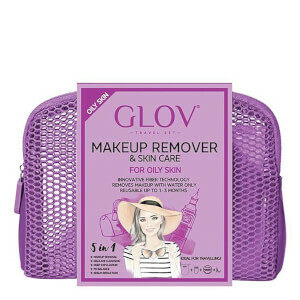 Specially formulated to remove makeup from GLOV cleansing mitts and makeup brushes. Free from chemical foaming agents, the travel-friendly cleanser is delicate yet effective; it delivers exceptional cleansing results to leave makeup brushes and GLOV fibres looking clean and refreshed. Infused with a natural Orange Oil fragrance.